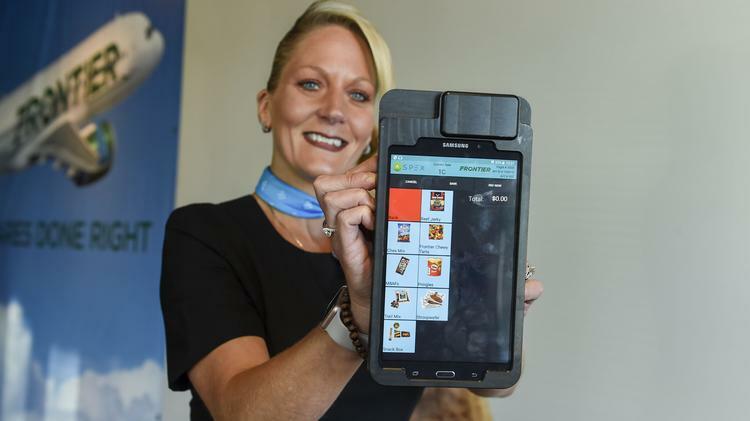 Tired of working with an outdated point-of-sales system that was costing the company some on-board revenue, Frontier Airlines executives turned to Samsung last year to provide it with 4G tablets. The Denver-based airline did it largely to make the work of flight attendants a bit easier. What it also got was a 30 percent increase in on-board revenue per passenger almost overnight, blowing its expectations out of the water. Frontier flight attendant Stefanie Coppedge shows off Samsung’s Fly Tab tablet, which has increased on board sales. Frontier’s story may be unusual in the size of the boost it experienced, but it’s far from the only airline to seek out technological solutions to improve long-standing industry processes. Upgraded systems are making tasks ranging from baggage handling to passenger loading to in-board entertainment both easier and more profit-driven for airlines that are seeking constantly to improve their margins. On-board sales, mind you, are just a small percentage of airlines’ overall ancillary revenues, with far more money coming in from baggage fees or seat-selection charges. But Andrew Brandess said that, especially for smaller and privately held airlines, improvements in those totals can both add to the bottom line and ease pressure on other sources of traditional or ancillary revenue. In Frontier’s case, the 4G tablets replaced a 2009 proprietary hardware system that required an Ethernet connection in order to download credit-card data after a flight. Since not every airport had the infrastructure to do this quickly between flights, that meant it could take a week for Frontier to charge people’s credit cards. And if the lag was that great, officials often would choose just not to charge them at all, Brandess said. The new technology allows the charges to upload immediately, helping the airline achieve average on-board sales of $150 per flight, Brandess said. And in addition to ensuring the charges actually go through, it does several other things that increase that revenue. Passengers can open tabs, allowing flight attendants to swipe their credit cards just once while continuing to offer them drinks and food throughout the flight whenever they want it. Cutting down on the necessity to pull cards out of purses or pockets each time makes passengers more willing to buy second rounds or products, and it allows flight attendants to move more quickly up and down aisles. Plus, the software embedded in the tablets allows dynamic interaction with incentives the customers may have earned. If they buy a bundled package, for example, that allows them to pay $29 for drinks and snacks and get an $8 discount on their purchases, and the tablets will know it, Brandess said. And it allows the home office to download sales information quickly to watch trends — as well as for flight attendants to send notes to officials in Denver about overages or shortages in certain products. About three months ago, Brandess said, he had cut down on the number of seltzer water containers on each flight because the airline had changed its alcohol mix; when those were selling out on multiple flights, however, attendants were able to alert him, and he changed the seltzer mix across the company quickly. Improving point-of-sales systems is just a start, however, said McCarty, whose company began working with airlines in 2011 when it partnered with American Airlines to provide Galaxy tablets for in-flight entertainment. It is working, for example, on ways to use mobile devices to improve work flow and work-flow management on below-the-wing operations — those functions from baggage handling to maintenance that are vital to airlines’ operations but often go unnoticed because they happen out of the sight of customers. Preliminary efforts are focused on getting scheduling information on the arrival and departure of flights to the crews handling these activities via mobile devices, so that they can keep up more quickly with changes throughout the day. Samsung officials also are looking at potential ways to get this information onto wearable devices in order to reduce the number of heavier devices that must be carried around, McCarty said. Another project of the company’s is to allow flight attendants to notify gate personnel immediately if the carry-on luggage bins on planes fill up. That way, passengers at the back of boarding lines can check their bags at the gate without having to get on the plane, search vainly for a bin and then walk back to the gate — a change in process that can improve departure times and cut down on customer anxiety, he said. Already, technology is improving the customer experience and satisfaction levels. Samsung has worked with American on its point-of-sale system to alert flight attendants about the presence and preferences of frequent fliers, for example. But these improvements could envolve into further improvements to the operations of flights. And in regard to what is possible, both Brandess and McCarty think the sky is the limit. “These are the kinds of discussions we’re having with our airline partners,” McCarty said.